With the help of our expert team of professionals, we are able to manufacture and supply Aluminium Window. These doors are fabricated using qualitative raw material that ensures their high durability everlasting finish, and corrosion resistance. We have multiple designs and patterns in various sizes of these doors. 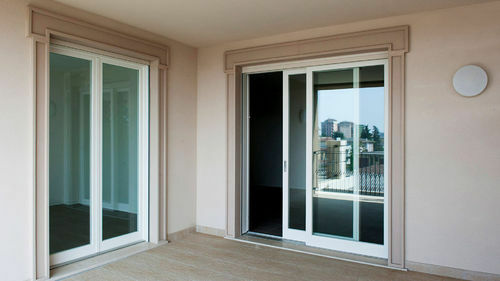 The doors provided by us are widely used in many residential and commercial places. We, Raja Interiors Private Limited, established our operations in the year 2005, as one of the trustworthy manufacturers, suppliers, distributors, wholesalers, traders and retailers of an unlimited compilation of Ladders and Plastic Products. Our product series comprises of Letter Box, Suggestion Box and Complain Box that are made available in numerous designs, sizes & color combinations, to cater to the varied requirements of our esteemed patrons. From the very beginning, we have been proffering flawless range in the market and this is the reason of our name and accomplishments. At our end, we have set up a state-of-the-art infrastructure facility that comprises of several machines & tools that help us in the obstruction free production, storage and easy loading & un-loading of the proposed series. With the continuous efforts and regular support of our team members, we have gained immense acceptance in the field. Adani Limited, Reliance and Shapoorji Pallonji & Company Limited are some of the key customers.